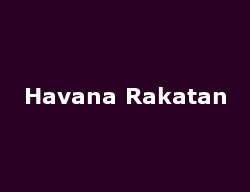 'Havana Rakatan' is a passionate and sensual journey through the genres of salsa, mambo, bolero, jazz and rumba performed with Cuban precision at the Peacock Theatre. Dancing their way through Cuba's rhythmic and rich resources of energy and exotic locations, the troupe (Ballet Rakatan) perform with Turquino the celebrated Cuban 'son' band. Ballet Rakatan were founded in 2001 by choreographer Nilda Guerra and have one a raft of awards, including the Five Star Award at the Edinburgh festival in 2006. There isn't a latin-style they haven't mastered and are truly at the top of their game. Turquino have played together since the early 80s specializing in 'Son' a fusion of salsa and Afro-Caribbean influences as well as most other Latin-American genres. The production is a busy, lively and colourful dance rush that wears me out just writing about it. Fun it's just got to be. You can get 50% off the full price on Monday and Thursday performances by clicking below - offer ends on March 4th. Click on the "Book This Offer" button, below to check availability. You will need to enter the discount code: TMDEAL into the "Ticketdeals Partner Offer" box - and also select the number of tickets you want from that box to receive the discount.